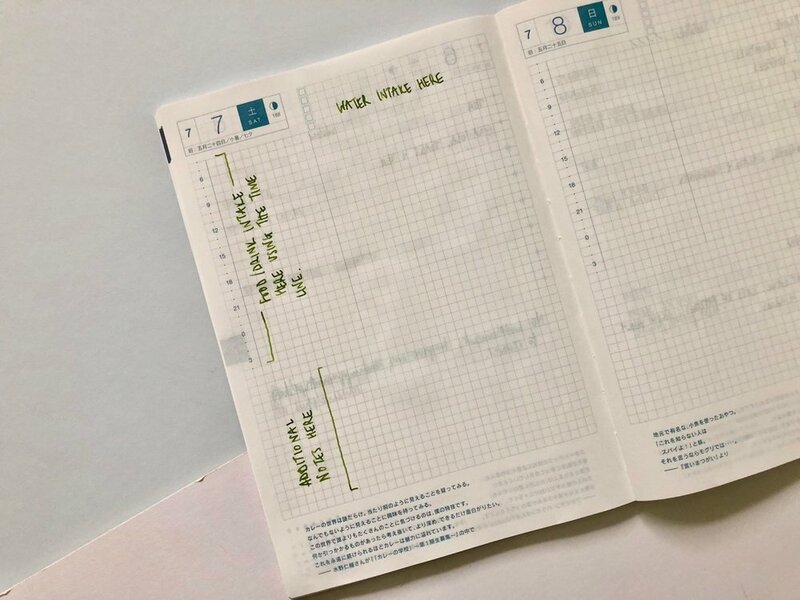 Using my Hobonichi Techo as a Wellness Tracker. It appears I have gotten a point (age) in my life where I need to be more mindful of my health, be more aware of the things I am doing to my body and to take better care of myself. There have been some ongoing ailments I have been dealing with since my son was born. They are relatively small but, now 2 years later, they feel like they’re hanging over me. In part I was not doing enough to get rid of these things, and on top of it there were new challenges that I had to cope with. This reached a boiling point in May when a ridiculous bout of eczema and psoriasis cropped up out of the blue and left me feeling quite down. So in order to try and make sense of things and understand what was going on I needed data. I turned to my stationery as a way of tracking what was happening. After enthusiastically buying the Hobonichi Techo Cousin in January and, for the first time in a few years, not actually using it, I decided to dig this out and use this as my wellness tracker. The Hobonichi Techo Cousin was the ideal choice; predated pages, a good size page to record everything and then for an added perk I could use my fountain pens on the sweet sweet tomoe river paper. Priority One: Tracking my food. The first thing I needed to track was my food and drink intake. There are various suggestions that dairy, caffeine and various other things can irritate skin conditions. Therefore I wanted to see if I could find any patterns and truth to this. Each page of the Hobonichi Techo comes with a 24 hour clock on the left hand side of the page and I have been using this to track what I am consuming and when. This has been fairly simple and just requires a little honesty even on those indulgent days. I would also note down my water intake. I am usually pretty bad at drinking enough water, but since tracking this I have noticed a huge improvement. The heatwave we’ve been experiencing may also have played its part here. Priority Two: Tracking my ailments. The second thing I needed to keep track of was what was causing me problems/grief/irritation and when. Too often when trying to relay things to doctors or physios I couldn’t quite pin down how long something had been a problem, or when it had started, or the level of discomfort, and where it was occurring. Underneath the time bar there is enough room for these notes each day. In here I have been adding in other things during the day that are relevant. For example I am taking a few liquid supplements at the moment, both of which are included in here if I have taken them. One of them is particularly disgusting and so I am not the best at having this everyday but knowing when I have taken it makes me more self conscious of making sure I do. I also write down if my eczema was particularly irritating and where I was suffering. I would record if and what medication I was taking to alleviate the irritation. I don’t like to rely on medication for my eczema so it’s useful to know what I use and when. I also have a flat foot from a longstanding childhood condition. Since gaining a lot of weight during pregnancy and all the crazy hormones that come during pregnancy this condition has gotten a lot worse and now requires regular consultations with doctors and physio appointments. 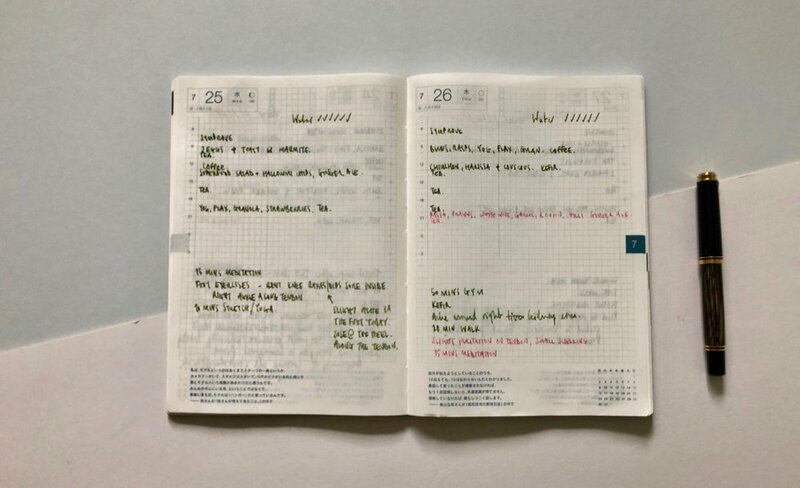 In order to get the most from this I have also been using the daily pages in the Hobonichi to note down issues with my foot, any days where I am struggling, any pain I feel. I also track my physio exercises here and when I am increasing the exercises. I hope that by tracking this information, during consultations I am far more aware of how my foot has been during a given period and what exercises help, or in some cases don’t. I track my exercise, how long I exercised for and what type of exercise I’ve done. Part of getting back to myself was re-adding exercise back into my life. But there was another reason to track my exercise, I could see if a particular exercise what irritating my foot too. The last thing I track here is my meditation. I have been using Headspace to try and learn how to manage my thoughts and anxiety, to try and carve out a bit of quite space within my day and generally to be more mindful. In order to ensure I am doing this everyday and taking the time writing it down in my Hobonichi focuses my attention. This is all really very simple stuff, I’ve not invented anything particularly special, it’s just something that takes time. I have my Hobonichi by my desk so its easy to note these things down through the day as I need to. The idea of the wellness tracker is just that, to try and make sure in my Year of Me, I am doing everything I can to be a healthier person and take care of my body rather than being passive through this process and losing more time. There are other things I want to include within this such as my mood for the day, my stress levels and what may be triggering this and my control over them. Given some more time working with this system I will be looking through the information I have gathered and see if there are any patterns. While taking the effort to note these things down I also have to do something with the information in order to really utilise it. This post has been a little different, with a loose link, to my stationery habits but I wanted to share how my simple stationery tools have helped to focus my mind. There are plenty of digital tools I could have used for this but they have the potential to complicate and distract. Pen and paper means I get down everything I want, quickly, without fuss in the way I need it. And the act of writing this down has forced my brain to acknowledge what’s happening in my body and perhaps is helping in the healing process. This could prove to be one of my most valued and treasured notebooks.